Paul Coleman provides a night of entertainment which cannot be matched by many! This crowd favorite crafts a solo acoustic performance bringing together praise, comedy, masterful acoustic guitar, moving allegories, and shared audience experiences that remain memorable long after the concert lights have dimmed. The founding member of the Dove Award winning and Grammy nominated ‘Paul Coleman Trio’, published soloist, and recently lead guitarist for ‘The Newsboys’, Paul has a large repertoire to leverage. Recently, Paul performed at the Cup ‘O Joy concert venue in Green Bay, Wisconsin providing two shows to a near capacity crowd. His solo acoustic performance pulls the audience into his world and subjects the audience to Paul’s Aussie sense of humor. An Australian by-way-of the U.K., Paul comes complete with a ‘down under’ accent and cultural difference he loves to share with his audience through dialog sprinkled between songs of praise, love, and the occasional comedic flair. The evening’s set list ranged from old to new and unpublished. Like his demeanor, the songs also ranged from praise to a sprinkling of comedic moments. “Gloria (All God’s Children)”, the ‘Paul Coleman Trio’s’ breakout hit mixed well with the new “Run”. ‘The Newsboys’ hit “Something Beautiful”, co-written by Peter Furler and Paul was beautifully offered in a mellow acoustic rendition. Showing his mastery as a musician, when a guitar string broke during the initial chords of “The Real Jesus” Paul did not drop a beat, singing the entire song without the accompaniment of his guitar while changing the guitar string! 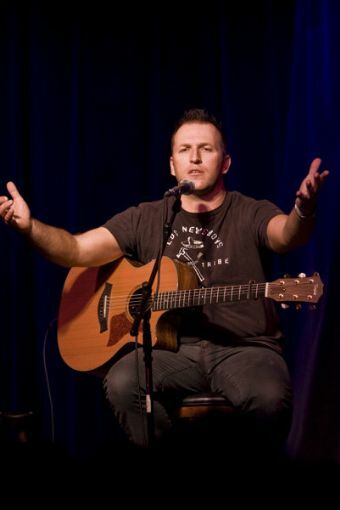 Paul Coleman is a story teller who brings out the truth in his faith-based songs. Having a large stage presence, he connects easily with his audience, proven by his ever growing following. This artist is very comfortable with his role as a performer, welcoming the audience to share his life experiences through music and word. As a warning, be aware that Paul’s humor can occasionally border toward the secular but is never truly off-color. While this night did not portray Paul at his liveliest, he again captured the audience while providing yet another performance to remember.